Last Friday evening we bravely slithered across (and a little bit out of) the city to The Old Crown Inn, one of the prettiest country pubs in the nearby environs, situated on the Bath-Bristol road that passes through the picturesque little village of Kelston. This enduringly popular proper pub has (fairly) recently been given a gently invigorating blast of TLC courtesy of the same new owners also responsible for The Inn at Freshford, The Cross Guns at Avoncliff and, most recently, The Griffin Inn on Monmouth Street. Original features such as wooden beams, flagstones and log fires have all been lovingly restored and maintained, complemented by stylishly quirky curiosities dotted hither and thither. Meanwhile, in the kitchen and at the bar, brand new menus have bought the pub’s refreshment options up to speed with stylish contemporary life. But despite the rather, erm, challenging weather, we were planning on partying outside… yes, really! The Old Crown garden is verdant, gently rolling joy to behold – even, as it turned out, on the same day that Bath experienced its first proper snowfall this year, when the pub’s new Garden Lodge really comes into its own. This cosy, fully-enclosed space has room for up to 150 people indoors and a further 40 on the covered, heated patio, with fire pit seating adjacent to the alfresco bar adding an extra dimension of inside-but-outside appeal. 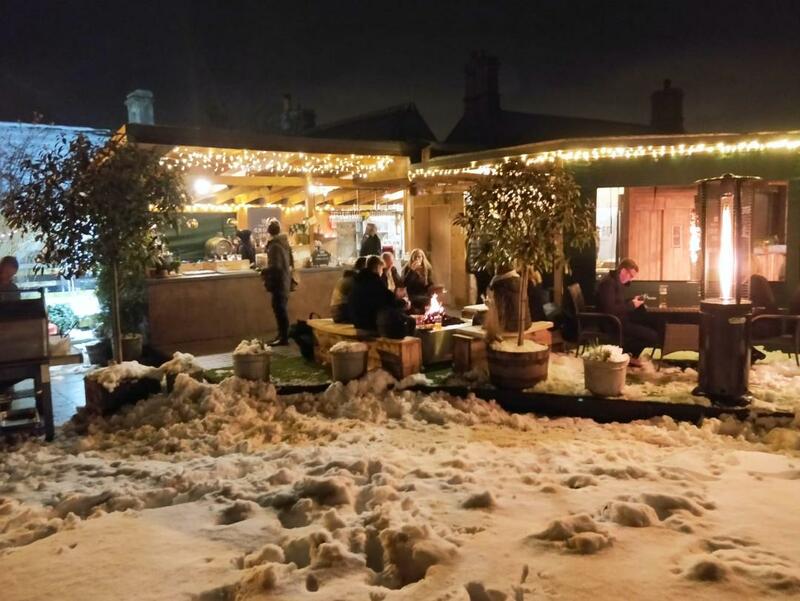 The Old Crown garden is available to hire for weddings and parties all year round supplemented by the pub’s sister operation Barabiku Outdoor, who are on hand to offer a complete hospitality service. Right now, we can’t recommend it highly enough as the perfect place to watch the Six Nations drama unfold. The next time we visit, however, it will be to review the pub’s menus and related delights… because we’re very proud to announce that The Old Crown Inn is the latest lovely Bath business to sign up for annual membership with us; now that’s the most heartwarming news we’ve celebrated this winter.